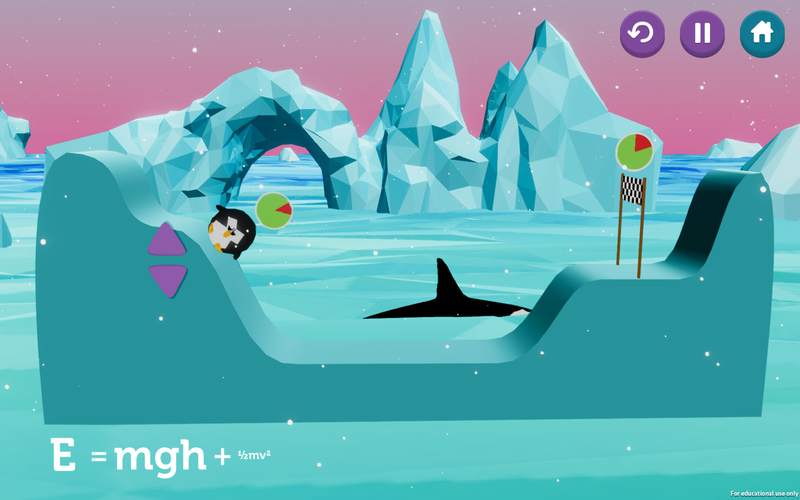 In order to facilitate an intuitive understanding of classical physics concepts, we have developed Potential Penguin - a game where players manipulate the landscape around a sliding penguin in order to control its movement. The learning goal of Potential Penguin is to familiarize players with kinetic energy and potential energy - the energies associated with movement and position in the landscape respectively. When the player manipulates the landscape, the potential energy of the penguin is changed, which determines the penguin's movement. To build a strong connection between theory and game the analytical expressions for kinetic and potential energy are displayed during play with font sizes continually growing and shrinking according to changes in each energy type. We aim to investigate whether a proficiency and understanding of Potential Penguin predict a better performance in Quantum Moves and a deeper understanding of the quantum physics behind that game. In order to test this hypothesis, we propose a study design comprising of three groups. Both of the first two groups play a version of Potential Penguin - one group with changing font sizes for the mathematic expressions, and one group with fixed font sizes. Group 3 will act as active controls, playing other casual games from our website, that similar to Potential Penguin require some amount of puzzle solving and fine motor skill, but which do not require any physics knowledge. This would ensure that the subjects in the control group are equally challenged on similar parameters as Potential Penguin. To test the main hypothesis, a pre-post-test consisting of problem-solving exercises with kinetic and potential energy would assess learning gains. An image labeling test where students are asked to identify the different game elements in physics terms would also be administered to both Potential Penguin playing groups to reveal any differences in the vocabulary the students apply in their understanding of the physics problems. If a stronger connection has been established by the changing font sizes we would expect the first group's vocabulary to contain more usage of physics terms compared to game terms (as per Lieberoth, Pedersen & Sherson, 2015). Afterwards, all groups would play Quantum Moves. A new image label test could reveal a transfer of terms applied in Potential Penguin especially when comparing to a third control group who have only played Quantum Moves. Finally, the ability to understand and pick-up the game mechanics of Quantum Moves will be investigated with data collected from the game and with the results from a questionnaire including the competence and controls scales from the Player Experience of Need Satisfaction (PENS) survey (Rigby and Ryan, 2007). Lieberoth, A., Pedersen, M. K., and Sherson, J. (2015). Play or science? : a study of learning and framing in crowdscience games. Well Played, Vol. 4, No. 2, pp 30-55. Rigby, S. and Ryan, R. (2007). The player experience of need satisfaction (PENS) model. Immersyve Inc.